Week 10 games were played November 6th-8th. This past weekend's Players of the Week (week 11) will be announced on our show this upcoming week. At the bottom of this post, you can see the listings for when and where it will be announced. We will also put them on our site a week from today. 10th Show of the Season! Listings and Lineup here! November 11, 2014	Comments Off on 10th Show of the Season! Listings and Lineup here! We have a great show lined up this week! Our in studio guests will be two former Northwestern State players, John Kulakowski and Ed Moses. John Kulakowski was the The Southland conference Defensive Player of the Year in 1987. Ed Moses stands 2nd all time in career tackles at Northwestern State. We will announce our week 10 Players of the Week. Lastly, we will have interviews with Block High School's Head Coach Benny Vault and some of his top players. Make sure to tune into this weeks show! 8th Show of the Season! Listings and Lineup here! October 28, 2014	Comments Off on 8th Show of the Season! Listings and Lineup here! We have a great show lined up this week. Episcopal Head Coach Travis Bourgeois and East Ascension Head Coach Paul Bourgeois will be our in-studio guests. We will announce our week 8 Offensive and Defensive Players of the Week. We have interviews with Barbe High School top recruit's Khoury Kraus and Collin Fountain. 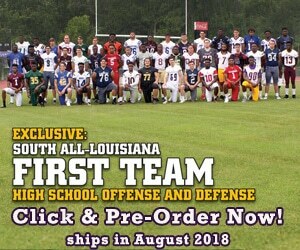 Lastly we will have interviews with top recruits Bry'keithan Mouton, Seneca Malveaux, and Javonis Issac of Acadiana High School. Make sure to tune into this weeks show! Fair Park High School Football has been very impressive the last few years. Coach Mike Greene has done an outstanding job not only in getting wins but in developing top level football players. Today's Recruit Video is with FS Joshua Pickett and WR/FS CJ Thomas. Both of these Recruits are sleepers who are going to make a college program really happy one day. Meet Joshua and CJ in today's Recruit Video. Week 5 games were played October 2nd-4th. This past weekend's Players of the Week (week 6) will be announced on our show this upcoming week. At the bottom of this post, you can see the listings for when and where it will be announced. We will also put them on our site a week from today. Hey Everyone, this upcoming weekend hosts one of the biggest games of the year as State Champs Acadiana High School visit State Champs Archbishop Rummel. Here are our Recruit Spotlight interviews with Bry'Kiethon Mouton, Ronald Broussard,Kevin Moore, Dezinarell Gray, Blaise Scriber, Eric Duhon, and Caden Cunningham.